High quality stainless steel post box by Brabantia includes a front loading letter slot with protective flap, which can accept large A4 letters. Drop down door secured by a key lock supplied with two keys. Rainwater proof and rust proof. Noise dampening materials - does not rattle in wind. Suitable for wall mounting (fixing kit included). Optional colour coded newspaper holder available. 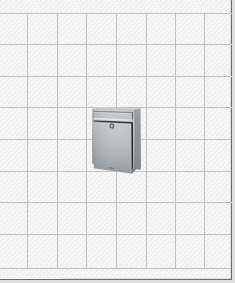 Brabantia	The Brabantia B100 Stainless Steel Post Box is constructed from high quality stainless steel ensuring it is fully rainwater and rust proof. The post box is secured by a key lock and incorporates a front loading A4 letter slot which is fitted with a protective flap that will not rattle in the wind. The drop down door includes raised sides and a door stop, forming a post tray, ensuring post cannot fallout when opening. Pre-drilled holes in the rear make it suitable for wall mounting and the post box includes a wall fixing kit.